Sun Lakes Country Club in Banning, California is a magnificent active adult community in the San Gorgonio Pass area of Riverside County. The community includes 3,300 homes and two 18-hole golf courses spread across 1,000 gently rolling acres. It offers a premier Southern California location, gorgeous views, and reasonably priced homes. Construction of Sun Lakes Country Club began in 1987 by the Presley Company. Ten years later the property was purchased by Pulte Homes who completed construction of the community in 2003. Sun Lakes Country Club is admired for its finely manicured grounds and attention to detail, evidenced by the beautifully landscaped terrain and blooming flowerbeds. A diverse mix of amenities cater to the social and fitness requirements of Sun Lakes Country Club residents. The community includes three large clubhouses that each offers top-notch attractions. 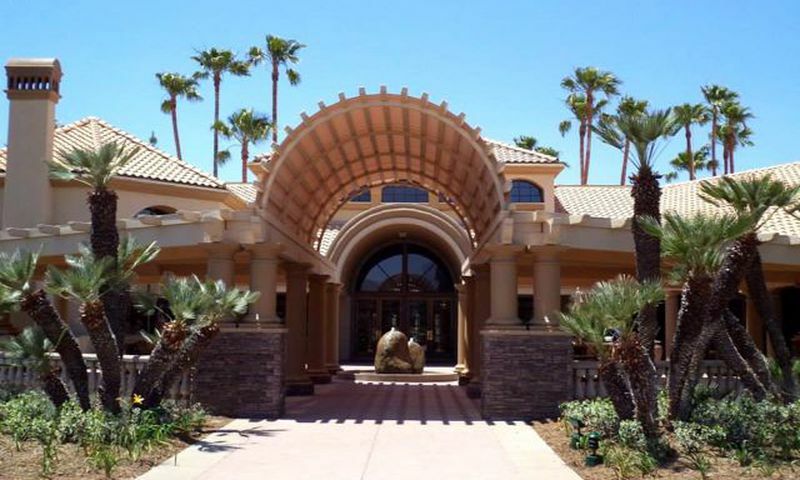 The Main and North clubhouses are accessible by both residents and their guests, whereas the South Clubhouse is reserved exclusively for the residents of Sun Lakes Country Club. The Main Clubhouse is the largest of the three and hosts a fitness center, library, grand ballroom, and veranda. This clubhouse also has a card room, arts and crafts studio, as well as a billiards room. The Sun Lakes Restaurant can be found in the Main Clubhouse. It offers casual and fine dining in a welcoming environment. Live music and entertainment is presented weekly in the adjacent lounge. The restaurant serves breakfast, lunch and dinner five days a week. The adjacent Sandwedge Grill serves great sandwiches and burgers on an outdoor patio. Outdoors, residents have access to a beautiful pool, patio, and pickleball courts for some friendly competition. Additionally, the North Clubhouses include a fitness center as well as a lounge and pro shop for all your golfing needs. Outside, homeowners are greeted with a beautiful pool and patio. Residents also enjoy tennis and bocce ball courts. Miles of scenic walking and biking trails wind throughout the community. The South Clubhouse, exclusively for community residents, has an indoor pool and fitness center for staying in shape. Tennis players will love the six courts just outside the clubhouse. There are two private immaculate golf courses in Sun Lakes Country Club. The finely manicured holes meander through the Sun Lakes neighborhoods and offer golfers breathtaking views of the towering San Bernardino and San Jacinto Mountains. The 18-hole Sun Lakes Course is a challenging 7,017-yard, par-72 championship course. The 3,000-yard, par-60 Executive Course is ideal for beginners and weekend novices. Only residents of Sun Lakes Country Club and their guests are permitted to play. Resident memberships are reasonably priced and provide unlimited golf for a year. There are a variety of real estate options in Sun Lakes Country Club. Throughout the 15-year construction of Sun Lakes, there were 50 different floor plans offered that range in size from 850 to 2,627 square feet. Homebuyers can choose from single-family and attached homes. Homes within Sun Lake Country feature two to four bedrooms, two to three bathrooms, and a two to three-car garage. Most of the homes in the community are single-level ranch-style residences. There are also several two-story models that include main-floor master bedrooms and living areas. Many of the homes enjoy magnificent views of the golf course and surrounding mountains. An activities coordinator at Sun Lakes Country Club continually provides the residents with opportunities to lead a vibrant social and physically active lifestyle. Every day, an exciting lineup of club meetings, activities, classes, and events are available to the residents of Sun Lakes. There are over 50 clubs and interest groups in the community that include everything from sports and fitness groups to cards and crafts clubs. Arts and crafts enthusiasts may enjoy participating in clubs like china painting, ceramics, quilting, or sewing. There are many card and game clubs that include bridge, chess, poker, and billiards. Music and theatrical clubs offer many dance clubs, singing groups, and performing arts clubs. Sports and fitness enthusiasts can partake in just about any sports club along with many aerobics, yoga, and weight-training classes. Sun Lakes Country Club offers a truly active 55+ lifestyle. Sun Lakes Country Club is located just south of I-10 between Beaumont and Banning, California. Palm Springs is a quick 30 miles east and Los Angeles and the beaches of Orange County are 80 miles west. Popular destinations such as Big Bear Lake and Mountain Resort are readily accessible within 30 minutes. The community is set at an elevation of 2,350 feet. The high desert climate and constant breezes keep the area approximately 15 degrees cooler than Palm Springs in the summer. Residents are also close to a shopping center that has stores such as Khol's, Wal-Mart, Target, Home Depot, Best Buy and more. Sun Lakes Country Club is an ideal active adult community in Southern California. The Main Clubhouse is the focal point for all social and physical activity within the community. The North Clubhouse is a smaller clubhouse that offers many ways to stay physically active. The South Clubhouse is another facility found within the community that is reserved exclusively for the residents of Sun Lakes Country Club. There are plenty of activities available in Sun Lakes Country Club. Here is a sample of some of the clubs, activities and classes offered here. These attached condos were built by Presley Co. between 1987 and 1991. Homes range in size from 850 to 1,356 square feet and feature two bedrooms, two bathrooms and a two to two-and-a-half-car garage. The Villa Series condos were built by Presley Co. in the early 1990's. Homes range in size from 988 to 1,473 square feet and feature two to three bedrooms, two to three bathrooms and a two-and-a-half-car garage. The Veranda Series is made up of single-family homes built by Presley Co. These homes range from 881 to 1,348 square feet and feature one to three bedrooms, one to three bathrooms, and a two-car garage. The Legend Series features single-family homes built by Presley Co. between 1987 and 1994. These homes range in size from 1,007 to 1,846 square feet and feature two to three bedrooms, two to two-and-a-half bathrooms, and a two-and-a-half-car garage. The Resort Series is made up of single-family homes built by Presley Co. between 1987 and 1994. These homes offer 1,214 to 2,044 square feet of living space. Homes feature two to three bedrooms, two to three bathrooms and two to two-and-a-half-car garage. The Executive Series is a collection of single-family homes ranging in size from 1,266 to 1,803 square feet. Homes feature two to three bedrooms, two to two-and-a-half bathrooms, and a two-car garage. The Promenade Series is made up of single-family homes built by Pulte in the late 1990's and early 2000's. These homes range in size from 1,288 to 1,978 square feet with two bedrooms, two bathrooms and a two-and-a-half-car garage. The Diamond Series is a collection of single-family homes built in the early 2000's by Pulte. These homes range from 1,458 to 2,137 square feet and feature two bedrooms, a den, two to two-and-a-half bathrooms and a two-and-a-half-car garage. The Atrium Series is made up of single-family homes built by Pulte. These homes offer two bedrooms, a den, two bathrooms and a two-and-a-half-car garage with 1,535 to 1,784 square feet of living space. The Terrace Series is a collection of single-family homes built by Pulte. These homes range in size from 1,878 to 2,226 square feet with two to three bedrooms, a den, two to two-and-a-half bathrooms and a two-and-a-half to three-car garage. The Classic Series is made up of single-family homes built by Presley Co. These homes offer 1,895 to 2,627 square feet of living space with two to four bedrooms, two to three bathrooms, and a two to two-and-a-half-car garage. I moved here 15 years ago as a widow. I felt surrounded by people who care. I felt very safe. The homes are beautiful and kept up nicely. Loads of recreation. Restaurant and Sandwedge for great food. Free entertainment in the lounge every Friday & Saturday eve with full Bar. Different venues each week. You won’t get bored. Close to Palm Springs but 30 degrees cooler. We get snow once a year but it melts right away. You can look at the beautiful mountains or take a trip to enjoy. Beach is within close driving distance. We’ve lived here in SLCC over the past 14 years. Both as renters and homeowners. Love the views, the clubs, especially the chorale, the entertainment, the classes, and most of all, the many great neighbors! Have lived here for over 15 years and are still thrilled with our decision. Well built home, reasonable home prices, numerous amenities and activities, championship golf course and par 60 course are both in great condition and reasonably challenging. Rules are fair and designed to maintain quality of lifestyle. Absolutely love it here. We downsized and moved here three years ago and it is probably one of the best decisions we've ever made! We looked at a number of otter 55+ communities in the vicinity and found this one to be the only one for us. SL has beautiful well- maintained grounds and golf courses as well as a gorgeous main clubhouse with a very good restaurant, coffee bar and sandwich shop. Sun Lakes has two other smaller clubhouses too!! There are a number of pools in the community, one of which is indoor. I also really appreciate our security and have found them to be helpful and considerate. We have lived in a number of communities with an HOA and we think our HOA here in Sun Lakes is worth every penny!! I don’t know who wrote the description of this place, but having toured it, there are NO walking or biking trails anywhere in the community. The nearest Target store is 30 miles away in Hemet. The grounds are well-maintained, but there seems to be an undue pressure to conform to the community’s “beige” standard. There appears to be no margin for any expression of individuality. In talking with some of the residents, the HOA Board appears to be very stodgy and unwilling to adapt to changing lifestyles. Sun Lakes Country Club is, without a doubt, the best kept secret in the 55+ community space. Having been a member of a private equity Country Club before moving here, I had some apprehension about moving to a Country Club "community". However, Sun Lakes Country Club has exceeded my expectations. Top quality Championship and Executive Golf Courses, a full pro shop with golf professionals on staff, three Clubhouses, tennis, pickleball, bocce, restaurant, lounge, weekly live entertainment, and more social activities than anyone can possibly be involved with make Sun Lakes Country Club the perfect retirement, or near retirement, community. will not regret your decision. My husband and I have lived at Sun Lakes for almost three years. It is beautifully maintained, with two gorgeous golf courses, and lovely trees and flowers planted seasonally. The amenities are amazing, with a great restaurant, lounge, ballroom, weight rooms, tennis courts, and Bocce, just to name a few. I could go on and on, as we love it here so much. I will say, the best attraction, for us, is the incredible people we have meet... so diverse, talented and caring. We think Sun Lakes is the best. Moved in a year ago and retired shortly there after. Best decision I’ve ever made. Stunning golf courses (2)...breathtaking views of two mountain ranges. More activities than I can participate in...fabulous restaurant, lounge sandwich shop and coffee bar. Entertainment every weekend... elegant and affordable! Best of all .....amazing people! Can’t imagine starting the next chapter of my life anywhere but Sun Lakes Country Club. I have lived here for the past 5 years. It was the best decision we ever made. We love everything about Sun Lakes. We say it's like living on a Cruise Ship that never leaves port. Lived in this community for 5 years, great neighbors and wonderful country club community, terrible HOA Master Board as well as horrible management company. Living here since 1994 and cannot find anyplace better! SL also has a fabulous lounge where live music is played during the weekends and happy hour. It is one of the best features. You never have to leave home and it is truly like living in a resort! Prices are still very reasonable even in this market, great selection of homes, and the HOA is well managed. You cannot beat the "pass" weather, and Banning's location is within 30 minutes of other major cities like Palm Springs, Redlands, Moreno Valley, and mountain communities. Wonderful community! We've owned here for 10 years and absolutely love it. The homes and various neighborhoods are gorgeous and immaculately kept, and the facilities are incredible. There are countless activities and clubs to choose from so there is never an excuse to be bored, and they keep adding to them and improving them all the time. 5-star restaurants, nightlife, countless clubs, planned vacations and excursions, tennis courts, 2 golf courses. swimming pools, the list is endless. Home prices and HOA fees are extremely reasonable for Sounthern California. We call this California's best kept secret. I love the different styles of houses. They're all kept up beautifully. Even if they're the same structure they look completely different because of the yard decorations. There are so many different activities that I don't know where to start. It is so beautiful here I enjoy just driving around and looking at the different houses and the view from the top of the hill. I had been visiting my girlfriend here for a couple years and she finally convinced me to make the move. After looking at communities all over the area I finally came to realize she was right all along! My condo here is perfect for me, the prices aren't bad and with everything that's included you really get a lot for what you pay for. I would highly recommend this community to anyone. 55places.com is not affiliated with the developer(s) or homeowners association of Sun Lakes Country Club. The information you submit is distributed to a 55places.com Partner Agent, who is a licensed real estate agent. The information regarding Sun Lakes Country Club has not been verified or approved by the developer or homeowners association. Please verify all information prior to purchasing. 55places.com is not responsible for any errors regarding the information displayed on this website.